First Of all I would like to thank Cezar Santos for his effort in bringing the best of ODI to the world . Confirming to trend of this site I shall explain the steps to ODI installation for window and Linux. After downloading unzip the files at a particular location . For Linux ,go to Setup -> Linux and run the script ‘ setup.sh ‘ . Before running the installation make sure you have the required permission to the files inside the folder else you would encounter error related to permission. Please find the screenshots of ODI Installation. Select the products as desired. 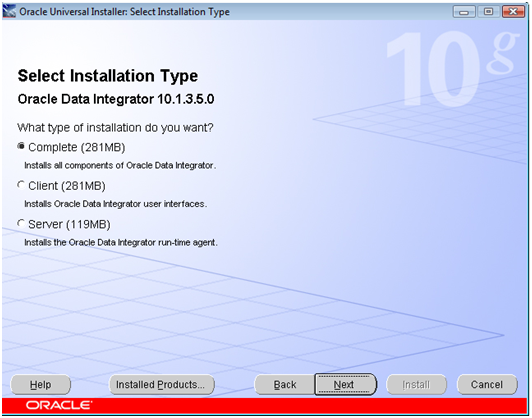 For the time being I am installing only the Oracle Data Integrator . I would be covering the Data Profiling and Data Quality at the later posts. Specify the Name and the Path of where ODI will be Installed . Click next and we are done with installation. 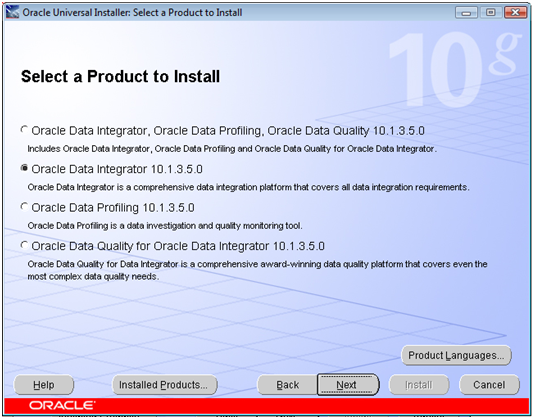 In Windows , the path is Programs->Oracle ->Oracle Data Integrator , as shown below . 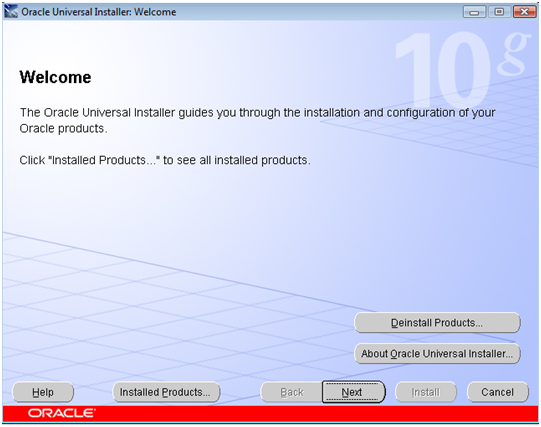 In case you encounter error or unable to complete the installation, the other easiest solution is to copy the ‘ oracledi ‘ folder from the downloaded unzipped file and give the necessary permission in Linux. The only thing you would need is to install JDK separately. For Windows go the ‘ Oracledibin ‘ Folder and access the required tools and go the Windows Environment Variable and add ‘ODI_JAVA_HOME ‘ with your jdk folder path. Here we are with ODI Installed. Look for my next post about setting up Master and work Repository. In the previous post (Repository Architecture – Just one Master – Part 1) we saw a proposal of architecture with one Master repository (MR) and just one Work Repository (WR). That first discussion was more about how important is to have the best backup policy possible and now I will present architecture for environment with one MR. We will discuss more than one MR in a future post. ALL ODI REPOSITORIES ARE AT PRODUCTION DATABASE!!! 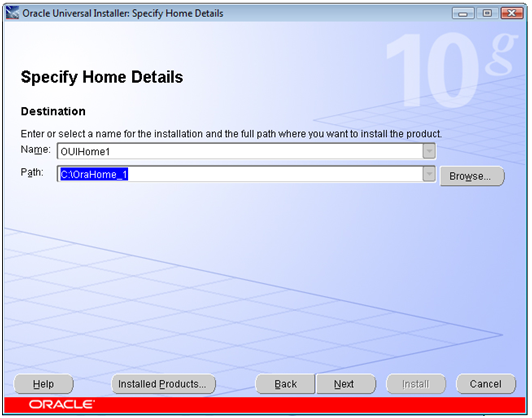 It happens except for ODI Applications (Agents) that will be installed at each environment. There is an agent that can be used to any development and can be restated or has its configuration changed at any time with no interference at Production process. There is an agent that can be used to any test and should be a mirror from production to allow a best test. The ODI Application (or agent) will execute all production process, scheduled or on-line. All ODI Repositories are in this hardware (even at distinct database if you thing necessary). The backup policy must be the same as any production system. The risk of loose information is the same of any other company system. Well my friends, that is the architecture as I suggest to be used. 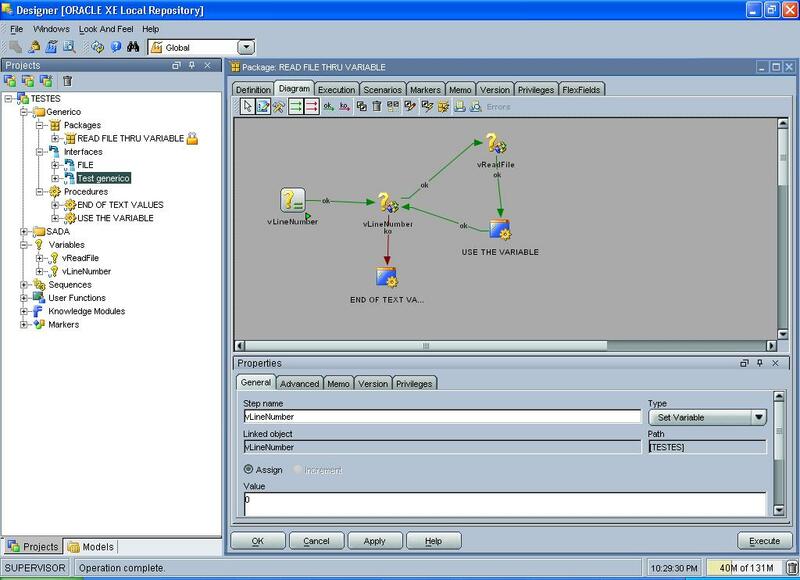 I will publish a specific post about how configure users to connect at database and his rights (ORACLE case) for this architecture. Please, any question just let a comment. 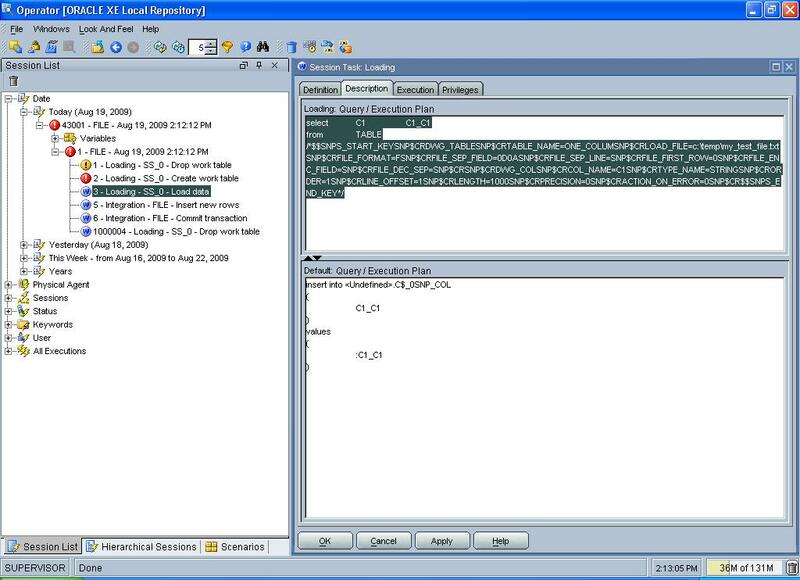 After what was showed in the “Part 1” now I will show how to loop thru a text file one line at once until the last. At true, it is a simple trick, let start…. 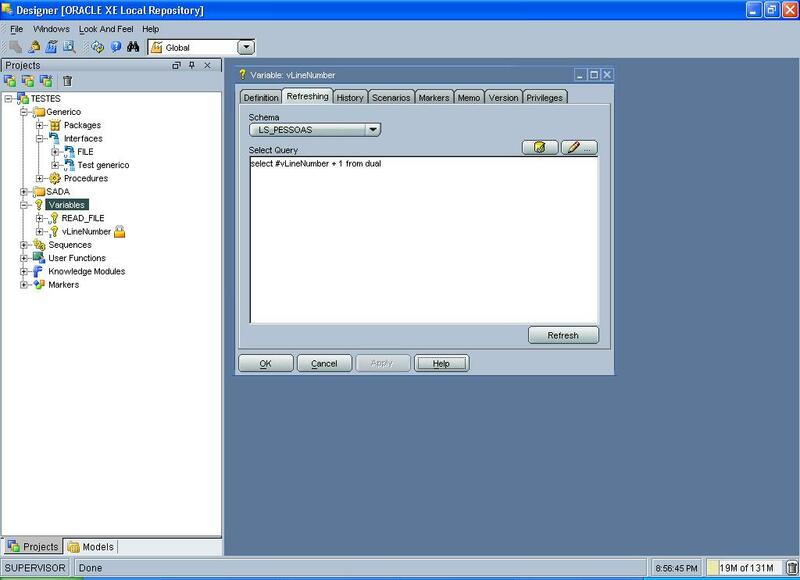 Drag and drop any ODI object that uses the variable like Procedure, Interface, etc. Well, it’s done. Now is just use the technique! Any comment, just ask me! Get value or values from file is a common question in ODI then, in the following lines and examples, I will try to show how simple is to achieve this! First of all, what is the problem description? 2) The flat file can or can’t have Header name (I used the case where there is a column header). one column (C1 in my case) and datatype String. I know that the file has a number content but let the column as String is intentional. All of this was done to get that generated code, the file JDBC. It looks a little confuse but I will explain each one of its parameters in a new post. Now just use the generated code at your variable! 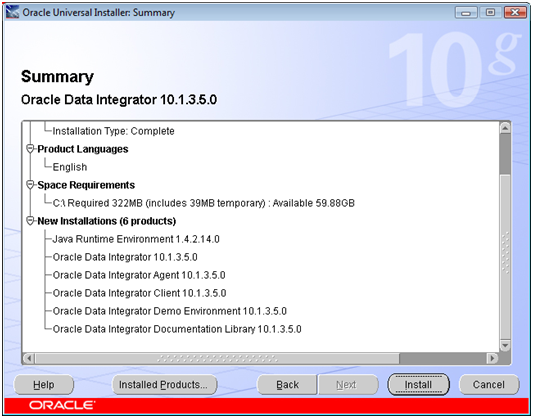 I believe this is a really good subject to start to talk about Oracle Data Integrator (ODI), once it is, necessarily, the first step in an ODI environment. My first point could be a little confuse to be understood at first because of the common way in programming language and “Development” concept itself but, once understood, it will becomes very clear how ODI environment must be treated. I hope you get this understanding when all parts of this post finish to be published. 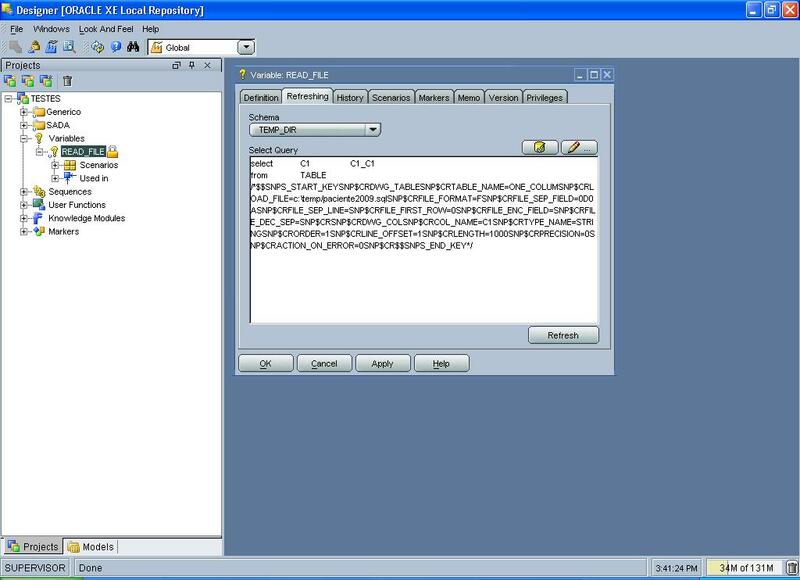 A client-server application that uses a centralized database to store any imputed information from this client side. As the project is “from ground” there is no production environment yet and, in cause of that, all ODI requirements for installation were supplied by a development environment with a good hardware. 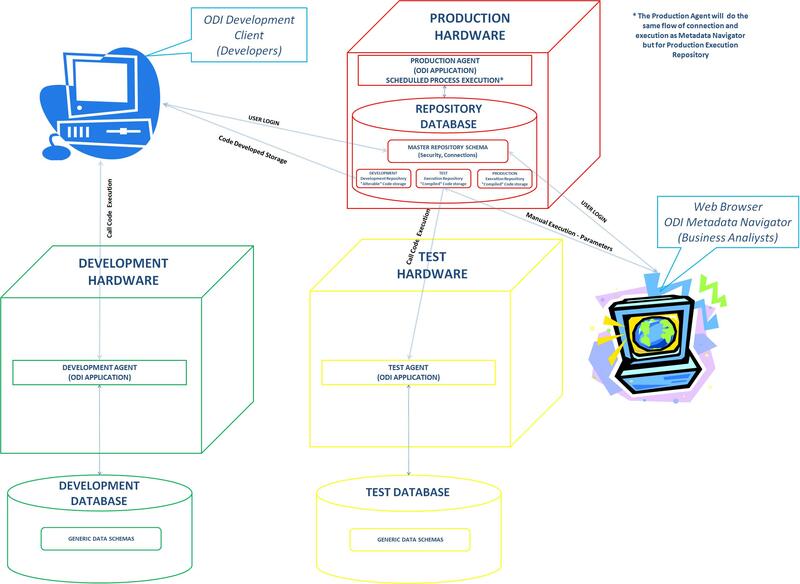 This hardware has the Database where the repositories (Master and developing work) and an ODI agent to test the developed scenarios are installed. I will call this development server as DEV_ENV. Three months after the project start, just 1 week before start the tests from the Business Users (or End users, as you wish) a CRASH of any kind of “no recovering” situation happens to this server… And now? What do to???? Case 1 – The bad one!!! Situation: As a Development server, there is no backup policy. The nightmare! Solution: There is no solution. All work need to be done once again, I mean, the 3 worked months.. I wouldn’t like to be you when you go to your manager office to tell him…. Case 2 – No so bad, but a lot of work.. Solution: Create empty repositories and try to import the “backup” into them. I already saw some bugs in this process, but they are less at each new version. I still do not trust in that feature, but could work and will bring back your development to the last “export”. I do not recommend or trust in this procedure once it is dependent of human action, I mean, it is completely manual and a human can “forget” to do it. Case 3 – Less problems. Solution: You have your development environment as old as is the backup frequency. In my experience, it is really rare to have a company with daily backup police on development servers…. Well my friends, I hope that you understood the problems and risks that this kind of architecture can bring to an ODI project. 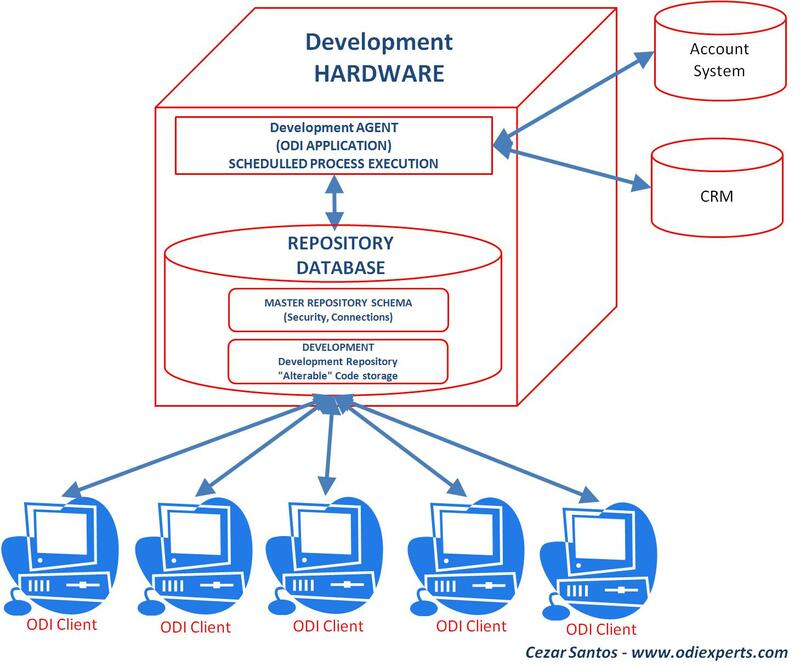 In the Repository Architecture – Just one Master – Part 2 I will suggest an architecture that I consider ideal when is possible to have just one Master Repository and too, why and how to use the 2 types of Work Repository (Developing Work Repository and Execution Work Repository). Thanks you for visit us! I’m really glad to start this site to share knowledge and exchange experiences with everyone that wants! That is an old project that only comes true because I found a really good friend and a incredible professional guy called Kshitiz Devendra who has been working hard to bring all of this to “production”, not more just a “project”. Thanks Dev, you’re the best. A little about me: My name is Cezar Santos and I have been working with ODI/Sunopsis since 2003, more than 6 years today. Besides that, I have always worked in the Data Integration world… At true, I started in the IT by “accident”. An accident called GAMES. Let me try to explain, I started to “work” with computers when I was 12 or 13 years old because of games…. 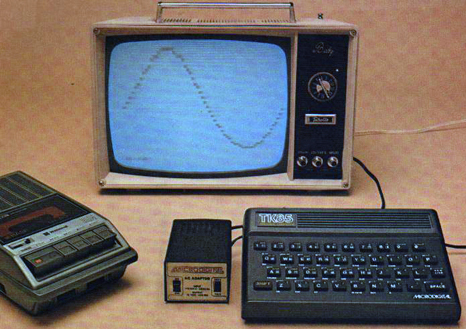 at that time we didn’t have Play Station, X-Box or Wii we had the TK85!!! Just like an old modem by half to an hour some times…. all of this to play a game with 3 or 4 colours!!!! Let me stop to talk about it! There is a lot more to tell but this post isn’t about this! hehehehehehe…..
After got contact with the “IT” world in my childhood I studied everything that I could find about computers and here I’m today, still absolutely in love for this incredible world. I have been working for companies like IBM, Brazilian Army, Banks, Brazilian Mail Company, Health companies, TELECOM, CRM, etc in a few countries like: Brazil, USA, Spain, Portugal, Argentina, Peru, Ireland, Chile (and few more) at all kind of projects and with a lot of technologies. This is just our first post with a little about me. From now forwarding we are going to start a lot of discussions about how ODI can be used at its maximum power.